We have all been through times where we need to deal with sensitive, private documents. Whether it be your divorce papers, test results, payslips, new job offers, or any number of other items, we want to keep them private. We certainly don’t want our co-workers to know some of the more intimate details of our lives. This is just one of many benefits to online faxing. Because all you need is a functioning email account and internet connection you can access your faxes from virtually anywhere in the world. No more queues forming in the corner around that noisy hulk of machinery as papers are shuffled back and forth across the whole office before you finally get your hands on that new job offer or gynaecologist test results. Online faxes come straight into your normal email inbox, you know that screen you spend your day trying to organise? You spend so much time there, you may as well streamline your communications to receive faxes there too. 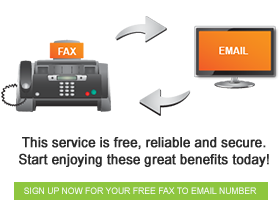 And while you’re at it you can activate an account that allows you to not only receive these faxes but also to send them, giving you a one stop solution to your faxing issues. Aside from fewer fax-machine-huddles you can save a fortune on ink and paper – no more wasted pages to say the fax failed to connect. Time and money are two things that dominate society, online faxing saves you loads of both.